New art gallery from Paris to open in Mayfair. This autumn, Paris-based Galerie Dutko expands with the opening of its first London space in Mayfair, at 18 Davies Street. A leading authority on the Art Deco movement worldwide, Jean-Jacques Dutko is reputed for staging the finest examples of Art Deco furniture with contemporary works to create panoramas of arresting elegance. Transcending a mere dialogue between the historic and the contemporary through careful, balanced compositions, Dutko Gallery’s offering will be the very first of its kind in London. The Gallery’s opening exhibition will present treasures from the Art Deco period,coupled with specially commissioned works. An oak, brass and travertine low table with cubic feet by Paul Dupre-Lafon (1930) captures Art Deco’s spirit of stylish functionality, while the works of Eugène Printz, once personal interior designer to Jeanne Lanvin, offer complementary inventive forms from the period. A recognised expert in Printz after authoring a book on his works, Dutko has sourced exquisite pieces exemplifying his eclectic style, from a Lampadaire ringed in oxidized bronze (1927) to a veneered desk supported by a hooped brass base (1930s). A major Art Deco highlight will be an ebony and bronze desk covered in python skin by Marcel Coard (c.1925-30), used personally by the designer himself. Continuing this touch of exoticism, a wool rug in intersecting plains of colour by Ivan da Silva-Bruhns (c.1925) will demonstrate the influence of Oceanic, African and Pre-Columbian art on Art Deco furnishings. Pieces by French artist and designer Eric Schmitt will form a remarkable counterpoint to these iconic works. Influenced by the French Art Deco tradition, curved, organic forms are especially prominent in his sculptural furniture, often featuring melted bronze, alabaster and marble manipulated by skilled craftsmen at his studio in Fontainebleau. Reminiscent of Printz’s lighting, his lamp Standing Stone offers a cylindrical base in white alabaster offset with flared polished brass, while, in dynamic contrast to the geometric precision of Printz’s table, the teardrop-shaped legs of console Leaf Double showcase a mastery of fluid shapes. Jean-Jacques Dutko has been at the forefront of Paris’ art community since the 1980s and is considered a pioneer in the field of Art Deco. After falling in love with a desk by Pierre Chareau, owned by Professor Albert Moulonguet, and becoming fascinated with the period’s rich history, Dutko rediscovered a number of great names from the movement. He can be credited with personally resurrecting the furniture of Eugène Printz, having long championed his inventive style and co-authored a book on his works. He went on to establish two galleries in Paris devoted to the genre, passionately seeking out new works to exhibit. In recent years, Dutko has also turned his discerning eye to contemporary works, forging relationships with contemporary artists and designers, and frequently commissioning limited edition works to complement his Art Deco findings. 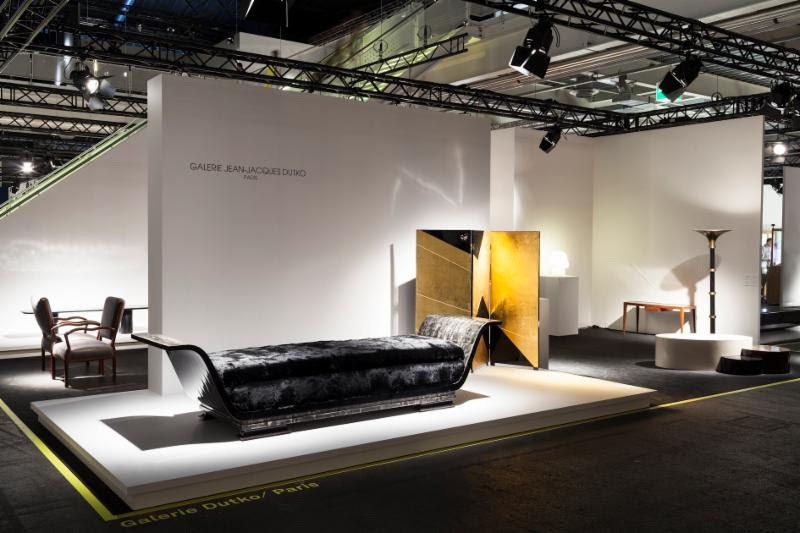 As well as numerous exhibitions in his two Parisian spaces, he has exhibited at the world’s major decorative art fairs, including the Biennale des Antiquaires in Paris, PAD London and Paris (Pavilion of Art & Design), Design Miami Basel, The Salon Art + Design in New York and the Brussels Antiques and Fine Art Fair (BRAFA). In addition to his own books which include E. Printz published by Editions du Regard, and André Masson, André Fougeron, Jean-Pierre Pincemin, Bruno Romeda, Robert Courtright, and Alexandra Athanassiades published by Dutko Gallery, Dutko is himself prominently featured in Histoires de l’Art Déco by José Alvarez (Editions du Regard), an esteemed reference book on the subject. All rare in provenance and distinctive in quality, the Gallery is home to furniture by icons of the Art Deco period including Marcel Coard, Pierre Chareau, Katsu Hamanaka, Jean Dunand, Armand Albert Rateau, Jacques-Emile Ruhlmann, Eugène Printz, Jean-Michel Frank, Paul Dupré-Lafon, as well as key designers from the 1950s including Pierre Jeanneret, Marc du Plantier, Hans Wegner and Jules Wabbes. These pieces are tastefully complemented by the works of modern artists such as Jean- Pierre Pincemin, Jean Degottex, André Fougeron, André Masson, Georges Koskas, Luis Tomasello, Robert Courtright, Takis, Etienne Béothy, Marino di Teana, and Emile-Antoine Bourdelle. Dutko also commissions contemporary works from sculptors such as Bruno Romeda, Alexandra Athanassiades, Lina Benkele, Hitomi Uckikura, Benoit Lemercier; from designers such as Eric Schmitt and Philippe Anthonioz; and painters such as Béatrice Casadesus, Takesada Matsutani, Vicky Colombet, Odon and Safet Zec. Sensitive to the work of the younger generation, Dutko also collaborates with Lauren Collin, Tom Henderson, Toni Ross, Matthias Contzen, Shoko Koike and Raphaël Scorbiac. As well as its newest Mayfair location, The Dutko Gallery has two others in Paris: an intimate space on Rue Bonaparte, Saint Germain des Prés held for over twenty-five years, and a second on the Ile Saint Louis, established in 2008 for larger works. Both are designed by renowned French architect Jean-Michel Wilmotte. This entry was posted in Art Stuff Paris, DESIGN, NEWS. Bookmark the permalink.